Snake handler in Manninhgam, Whitehorse, Banyule, Nillumbik ph 9812-3322. Phone 9812 3322 or 0412-777-211 for 24/7 emregency snake removal, control and capture in all suburbs of Melbourne. In Manningham and nearby areas, such as Nillumbik, Banyule, Whitehorse and Maroondah, and elsewhere in Victoria, one person that can sometimes be in demand is a snake handler or the man who owns the reptile removals company. With all local species being potentially dangerously venomous and most also potentially dangerous, it is important that handling of these reptiles and the snakes in particular be left to the experts. There are a number of accredited snake handers and snake handling courses on offer these days, but not all are experienced. 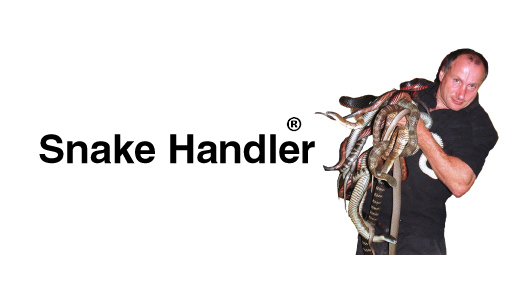 In Melbourne, the best known snake handler is Raymond Hoser and as a result he is the only person in Australia who actually owns a registered trademark for the words snake handler, the trademark being for a logo with the word and himself holding no less than 14 deadly venomous snakes in his bare hands. As a licenced snake handler, Raymond Hoser has been on global TV shows showcasing his unmatched skills as Australia's best reptile handler. Besides being a snake handler, Hoser's expertise with reptiles is, as already mentioned unrivalled, and includes hundreds of scientific papers and books and the title of having named more species and genera of snakes than anyone else in the last 100 years! As a reptile handler and well-known expert, the snake man is on call all the time to educate others about reptiles, frogs and other wildlife and he does this in wildlife displays, reptile shows and even in childrens reptile parties, this being a concept he invented in the late 1960's and something he's been doing ever since. It was for that reason he even got the registered trademark for reptile parties. As a snake handler, Hoser is on call daily to remove deadly snakes from houses and other business to save the lives of both the affected people and the affected snakes. Notwithstanding Hoser's stellar career with reptiles spanning more than 40 years, he finds himself in the post 2000 period under attack from inexperienced imitators seeking to take his business and reputation by unethical means. Even more scandalous has been the cooperation of corrupt ex-cops and others in their ruthless attack, not just on the snake man, but on Australia's uniquie wildlife in a manner that puts both species at risk and has already caused people's lives to be lost as a result of their misconduct and dissemination of wrong and dangerous information. In terms of snake removal and snake capture, Raymond Hoser has been doing this in Nillumbik, Banyule, Whitehorse and Maroondah, and elsewhere in Victoria for many years and as a local snake handler has unbeatable local knowledge, meaning that if anyone is likely to be able to find and capture a snake seen in the garden or home, then Raymond Hoser is it. Further information can be found on the snake capture wesbite for Manningham and nearby areas at http://www.snakebusters.com.au/sbsmel1.htm, where all your snake capture, snake removal, snake handler, reptile relocating and other snake catchers questions are answered. Manningham Snake handler and reptile removals. This document is copyright. Copyright 2014 Manningham, Nillumbik, Banyule, Maroondah and Knox, snake removals, catcher, handler, catchers and relocations. All rights are reserved and trademarks registered.